The Harmony Apartments is a 17-storey building with 197 residential strata apartments, 5 levels of basement car parking, 8 ground-level retail and 2 commercial units. Well-positioned in Sydney’s Haymarket, it is a stone throw to Central Station, Chinatown precinct and Darling Harbour; and a short stroll to to UTS, TAFE and Sydney University. Competed in July 2004, the site on Quay Street is full of history. Starting out as the Empire Theatre in 1929, it opened with musical Sunny but soon converted to a cinema and stayed so till late 1948. The shortage of theatres post-war saw it reinstated once again as a theatre. After extensive alteration and renovation, the theatre was renamed Her Majesty Theatre on 21 May 1960 opening the hit musical My Fair Lady. The Theatre remained in operation for 10 years but was burned down in 1970, although rebuilt in 1973, the theatre never flourished thereafter and was eventually bought by billionaire developer Harry Triguboff of Meriton in 2001. Appointed Chairman of the Owners’ Corporation Executive Committee in late 2011, by mid 2012 I had formed the view Harmony was in need of a facelift after seven years. Whilst the building exterior looked fine, the interior presentation did not do it any justice and in my view was a detriment to building value and rental potential. With new developments coming online nearby, it was critical to present well to remain competitive. Of course things are never easy and if you’re familiar with strata living, there was a bit of “politics” and red tape to jump through before I could execute my “grand” vision – to create a great first and lasting impression. So by late 2012 I had an interior designer engaged and we were busy choosing the theme, colour schemes, finishing, furniture and fittings. Finding the right building contractor to do the work took some effort but by March 2013, I had a good idea, but it wasn’t until July that I was able to sign on the dotted line. Straight after we were able to place an order for stock, and last minute, I’d decided to switch to commercial grade carpet tiles for ease of replacement down the track. Stock arrived with minimal fuss except the wrong tiles were delivered first time round. The longest wait was for the 3000K Warm White LEDs, a 6-8 weeks lead time – but definitely worth the wait as it creates a much softer/warmer ambience than the cool white LEDs. First part of the project was to change all common area lighting, including all the basement car parks and this was completed by July 2013. Next was painting the hallways, starting top down from the second highest floor. Why the second highest floor? Well, as we embarked on the refurbishment project, more “holes” surfaced and a large outdoor terrace on the top floor had to be replaced and the entire roof resealed. 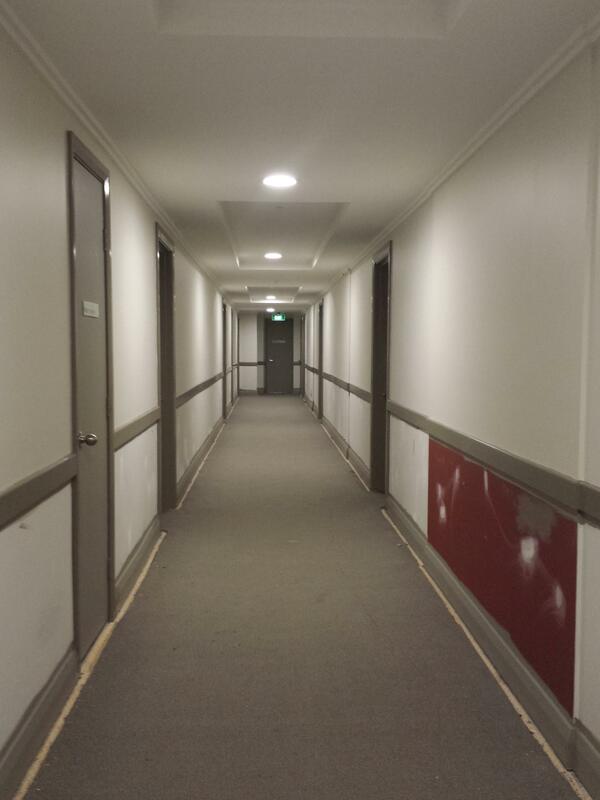 The building manager did a great job at coordinating getting all the apartment doors opened so that the contractors could replace the hallway carpet and repaint every apartment door. Getting some residence to open up was harder than others but we managed. By late July, the first floor was fully repainted. On review, after consultation with the designer, project manager, paint specialist minor tweaks were made…then full steam ahead. On average a floor was completed every 7 days. By September, the makeover for every floor was complete except the top floor (which was finished late 2013). It was time to start work on the lobby/reception but we hit a road block. In short, further “politics” and legalities delayed our schedule. Fortunately, the matter never went further than the legal advice stage and was resolved with a bit of common sense. Two months behind schedule and with Christmas fast approaching, there was no time to waste and with that the lobby refurbishment was in full swing in mid November. Not before long Christmas was here but the work was only 70 per cent done. As things gathered pace in the New Year, work was 95 per cent complete by late January 2014… Drumroll please! After 18 months of planning and waiting, I’m happy with the end result. Obviously this couldn’t have been achieved without a great team of professionals working tirelessly together. Feedback has been positive and resale value is certainly up. Partly due to the strong upward movement in the Sydney market, but I’m confident Harmony now presents itself to potential buyers and renters better than ever before. Personally it’s been a rewarding journey and I’m looking forward to the next challenge.